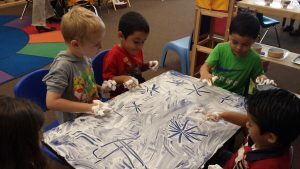 Our Activities – Montessori School of Davenport Inc. 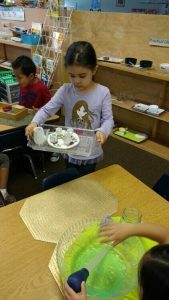 When a parent walks into a Montessori classroom, the first thing you will notice is that all the children are busy and interested in what they are doing. One child may be counting, while another is reading short words — all are engaged in activity. Each classroom is designed to fulfill the developmental needs of the child. The Montessori Practical Life activities are designed to help the child develop fine and large motor skills, concentration, coordination, and sequencing. Practical Life is a link between the school and home, in other words, children will be presented with familiar things they see and use at home, yet the items are formatted into “lessons.” These lessons help the child to begin starting an activity, completing the activity and putting away his work and at the same time, develop concentration, order, coordination, completion of task. Practical Life also incorporate exercises of grace and courtesy. As the child proceeds to do lessons in the Language and Math and other subjects, the concept of temporal relations (concept of beginning to ending, an understanding of an order of events), will be of great importance to him. 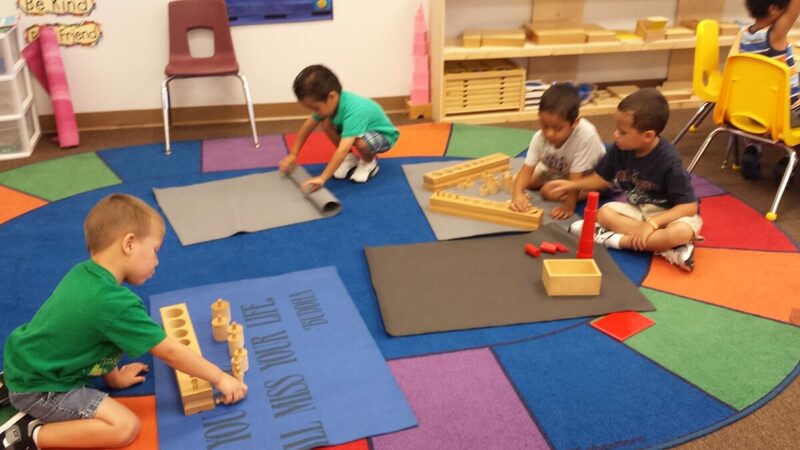 The Montessori Sensorial materials are designed for sensorial exploration. Children build cognitive skills and learn to order and classify by touching, seeing, hearing, smelling, tasting and exploring the physical properties of their own environment. This important area of the Montessori classroom that helps to development all five senses. It is intriguing and purposeful as every piece of material has a developmental skill that the child gains by the use of it. Language development is vital to human development. The Montessori classroom is rich in oral language opportunities, allowing the child to experience conversations, stories and poetry. As the child’s window of opportunity permits, he is introduced to the “sandpaper letters,” which help children to link sound and symbol effortlessly, encouraging the development of written expression and reading skills. Here you will find beginning exercises to more complex equations and exercises. The children are introduced to beginning exercises that focus on the skills of counting and recognition of numerals 0-10, one –to –one correspondence and sequencing, which help children to develop their memory retention. They are also exposed to the Decimal system, linear counting, fractions, writing numerals, addition, subtracting, multiplication and division, by use of the Montessori Math materials. 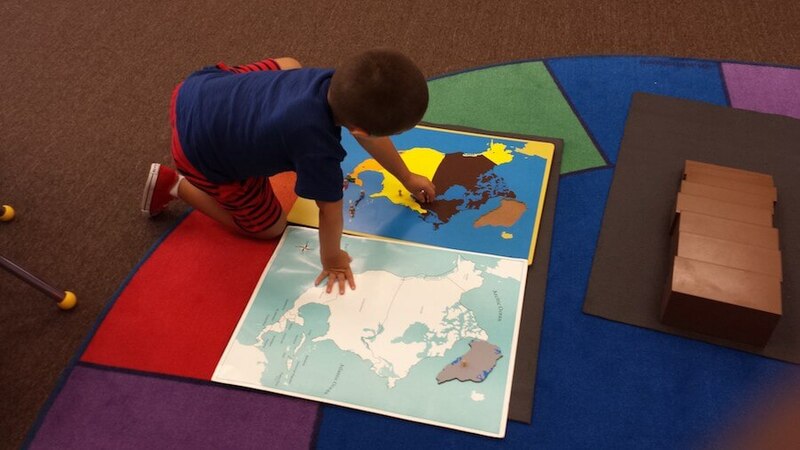 Montessori Geography is approached in a sequential way. Land, Air , Water: The Land and Water globe; The Continent globe; maps;, festivals, celebrations, the country we live; the state we live in; flags; the solar system and more. Children learn how to recognize the seven continents of the Earth, understand the rotation of the Earth and understand the basic needs and lifestyles of people around the world.